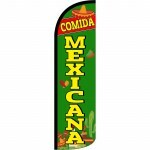 This Comida Mexicana (Mexican Food) Swooper Flag, also called a feather banner, has a vibrant colored background with quality graphics/text; which makes this sign an ideal advertising banner. Each flag stands 138 inches tall by 36 inches wide. 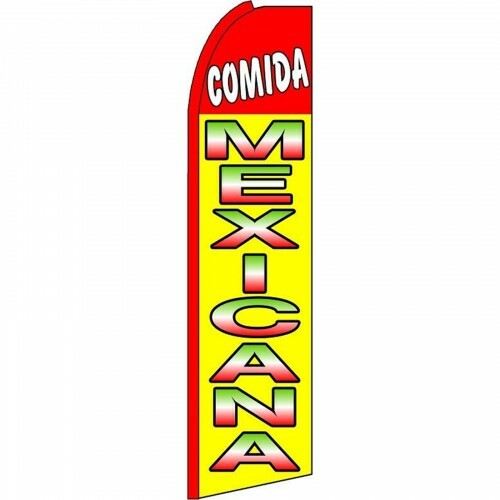 The comida mexicana (mexican food) swooper flag feather banner’s sheer size alone can be seen from afar and is more effective at reaching customers than other traditional signs while the special curved pole keeps it standing tall to attract attention. 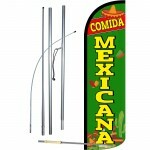 This flag is constructed from UV treated, lightweight and affordable polyester, balancing quality and affordability. 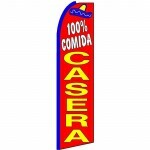 The graphics are imprinted using dye–sublimation for fade resistance. 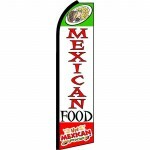 Each banner is single sided with a bleed through to the back which means that there is a mirror image of the graphics visible on the reverse side. 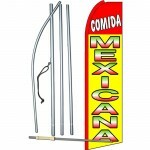 Customize your order by adding the pole and preferred mount. Not sure what you need? Call and speak to a live specialist now, we will be happy to assist you!